Scarves are most beautiful and colorful accessory one can wear, it enhances the beauty of a lady. As the spring arises, there is no better way to prettify the cute and charming sundress than having a colorful scarf. Choosing what kind of scarf to wear is not as much difficult task as tying it around the neck in appropriate style for every occasion according to it. 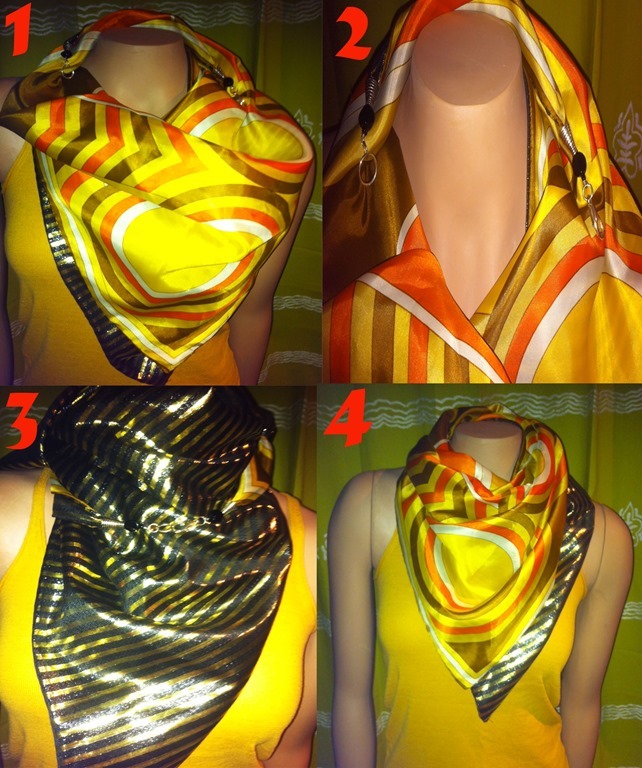 Some of the cool and creative techniques are compiled up to tie scarves by using all kind of scarves whether it is long scarf, loop or circle scarf, or any other kind. 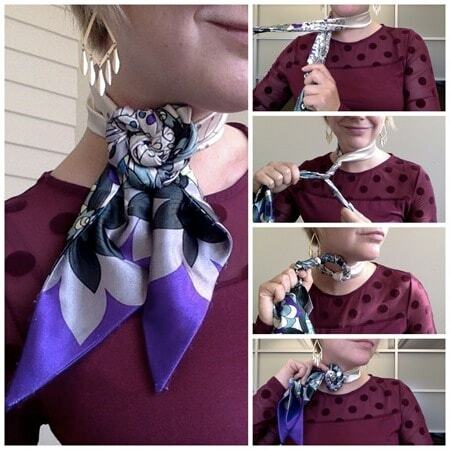 Easiest and classic way to tie a scarf around neck Slip Knot, also suitable for formal outings. Half fold the scarf and put it around the neck. Pull both of the open ends of the scarf into loop. Adjust the scarf comfortably according to your convenience. Leave the knot loosely or can fit it around the neck. 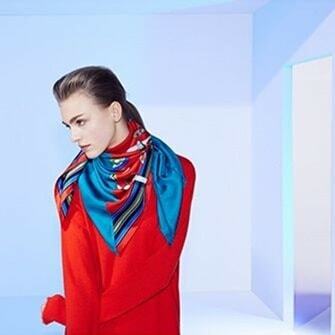 Sprawl the scarf over the neck, with one of its end notably greater than the other scarf. Twirl the scarf around the neck two to three times in the direction. To fix the twirl of the scarf tie a simple knot and tie another overhand knot in order to fix the extra piece of scarf left. Put both of the knots beneath the loop of scarf , so that it look clean and perfectly tied. Twirl the scarf around the neck with one of its end comparably longer than the other. Whorl around the longer end of the scarf only once. 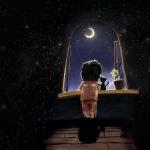 Take the end that you looped and sheltered it by the top of scarf. Fit the top corner into the loop. When this is done properly, the unattached side droops down like the waterfall. Tie any of the two ends of scarf. Wrap the scarf twice around the neck leaving the knotted end free downwards. 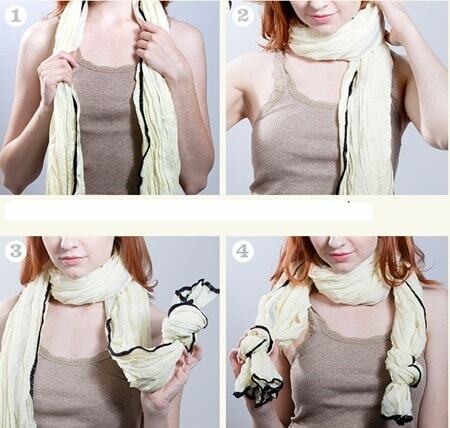 Bring the loose end of the scarf through the scarf. Now fit the scarf around neck as per your convenience. Fold the scarf exactly from the middle. 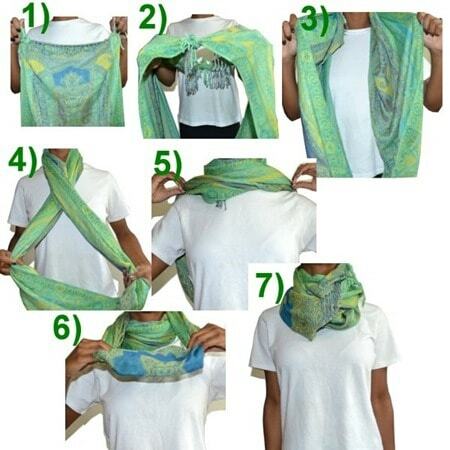 Wear the folded scarf around the neck with the loose ends comparably longer than the folded end. Put the noon folded end into the loop created by the folded end of the scarf leaving behind the space in the loop. Twirl the folded end into itself and forming a pattern of “8”. Tighten the scarf and fit it according to your convenience. We can just simply wrap scarf around shoulders. Place the scarf at front of you neck with ends of the scarf upon your shoulders ,cross the two ends with each other and bring them to the front. Tie the both sides into an overhand knot in front of your neck. 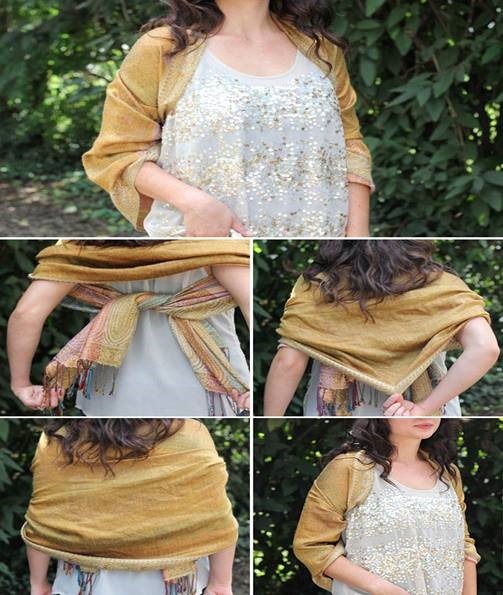 Take the scarf and twist,fold in half and drape behind your neck. Pull the scarf through the loop,bring both ends of the scarf through the loops. Skew slightly to the one end,Adjust. Twirl the longer end around your neck and not completely tighten it. Let the twirled end hang down to your back. Place the scarf around your neck,Loop it. Tie a knot on the one end,Tie a knot on the other end, Adjust. 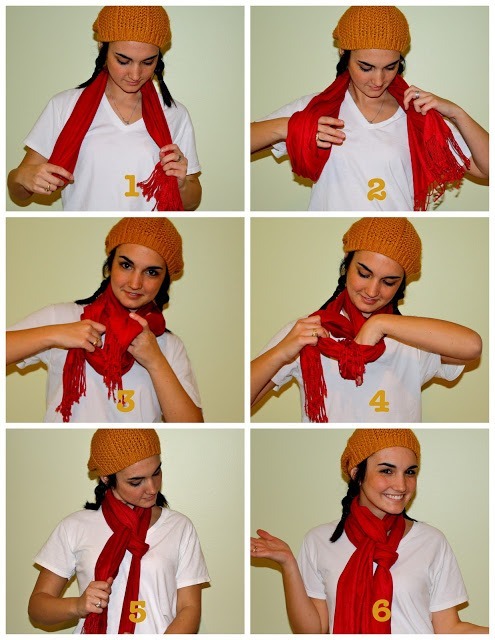 Hang the scarf 1/3 on a side and 2/3 on the other around your neck . Wrap and make a simple loop around your Neck with longer one. Hold your loose end and twist it tightly to the right and then wrap the twisted section around the main loop twice. 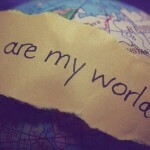 Repeat it with another side too. 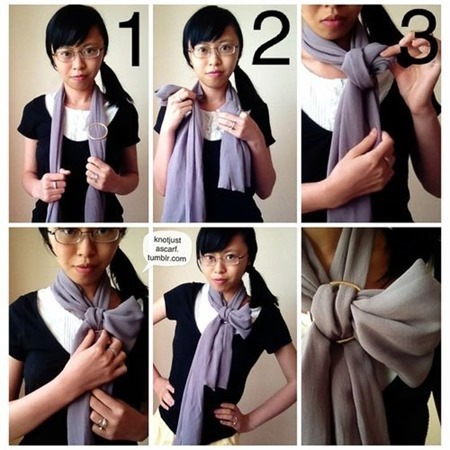 Drape scarf around your neck once and create a full circle loop on one end of the scarf. Pinch the center of the loop and begin wrapping the scarf around the loop from the underneath with the loose end. Continue pulling the loose end around the pinched loop and tie a tight knot in the center. 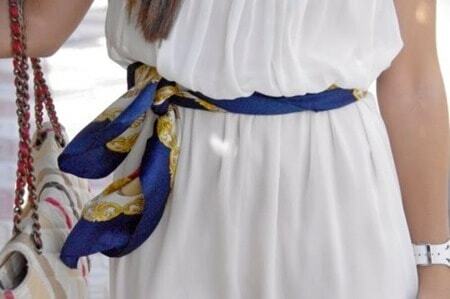 Place an infinity scarf around your waist. 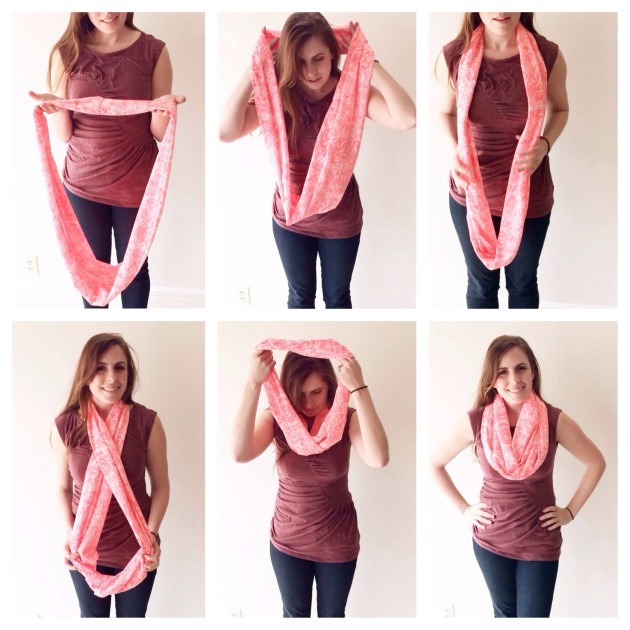 Twirl the scarf once at your first creating figure 8. Find the middle of scarf then place it around the shoulders with the free ends hanged down at the back. Bring back the two hanged ends of scarf to the front but after crossing the both ends. Loosely tie a knot between the two ends and adjust, tighten it to your neck. Fold scarf in half creating a triangle. Wrap scarf from the front leaving the point of the triangle near your navel. Over the top of the triangle, bring the tails of the scarf to the front and tie a square knot letting some scarf billow over the top. Take a scarf and finds its middle and wrap it around your neck with the freely hanged ends at the back. Bring the back ends towards the front. 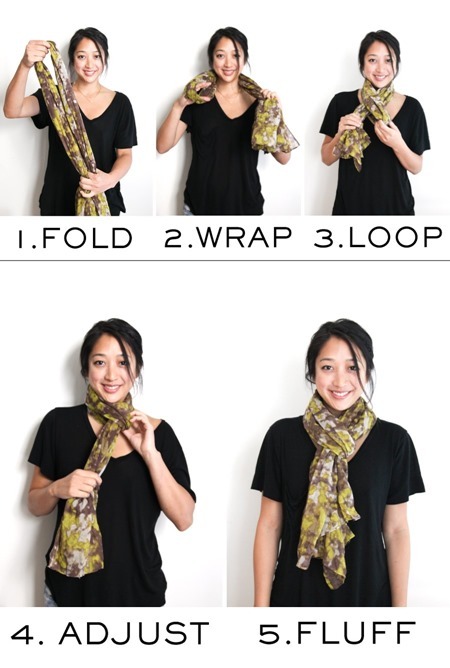 Take the ends of the scarf and twist them around with each other by making it loop. And tighten it until it suits to your neck. Fold the scarf in such a way it form a square. Fold one end to another in order to form a triangle. Put two ends of triangle over the back of your neck, leaving a point down in the middle. 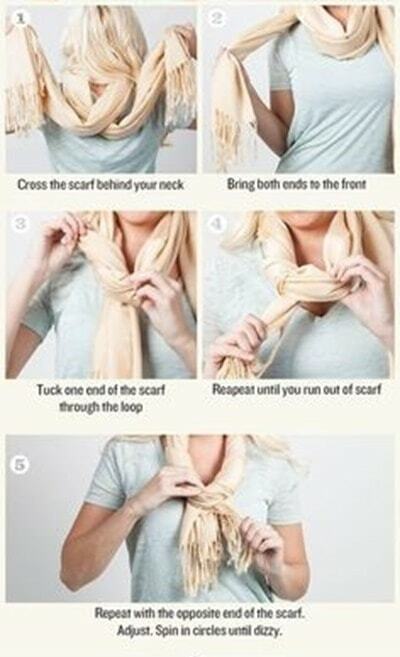 Tie the scarf at the back and adjust accordingly. Fold on and on the scarf till it gets the desired width. Wrap it around your waist and tie a knot at the back. Put the scarf around you shoulders with its free ends at the back. 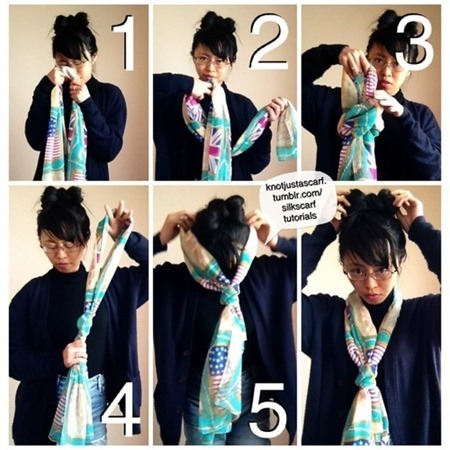 Tie a loose knot at the back with the two ends and cover it with scarf. Now adjust the shawl from the front. Wrap the scarf behind your neck. Take one end and wrap it around your hand. Pull it through to make a loose knot. 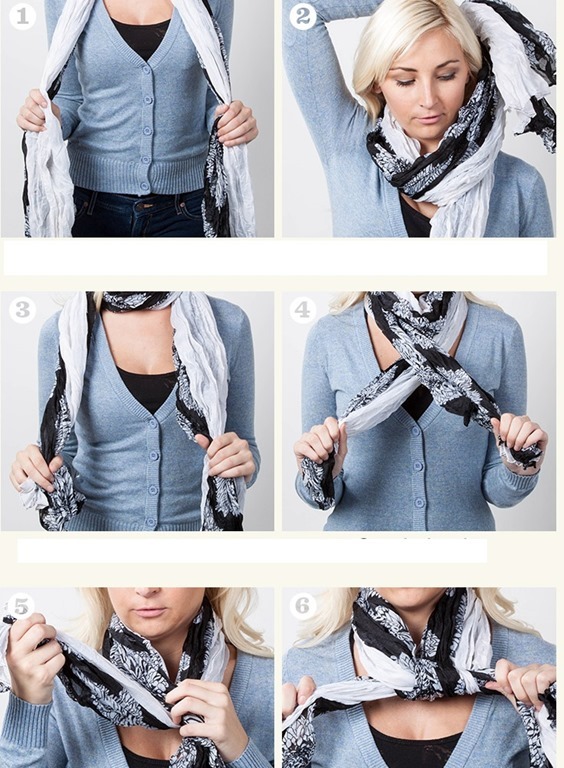 Take the other scarf end and pull it through the side knot, going under the knot loop and then over. Find the middle of the scarf and drape it around the neck so that free ends hang at the back. Twirl the scarf around the neck and loosen its loop so that it must be comfortable. Cross one end over another and tie a knot. Adjust the loop so that it covers the tail in its front. Fold the square scarf to form a triangle. Place the scarf around your shoulders in such away the two edges it comes in front and longest edge comers at the back. 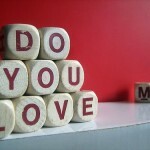 Tie the knot between two edges at the front and adjust it. Fold the square scarf diagonally and let its two ends come at the front. Tie the knot at the front between two ends and adjust it also give it some fluffiness. 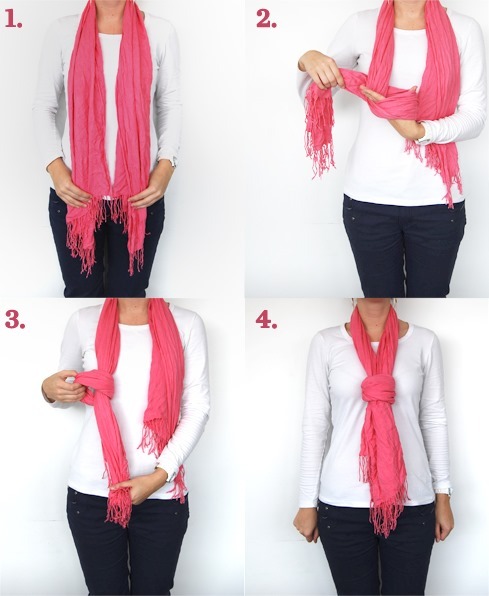 Take your scarf and hold one end of the scarf in one hand and one end in the other (lengthwise). 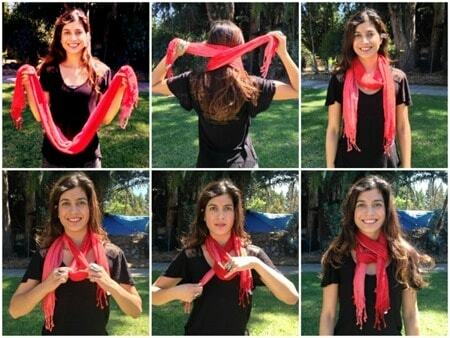 Now take each end in your hands and put the ends around the back of your neck to form a U-Shape with your scarf. Criss cross the end of the scarf to change the U-Shape into an x shape behind your head. 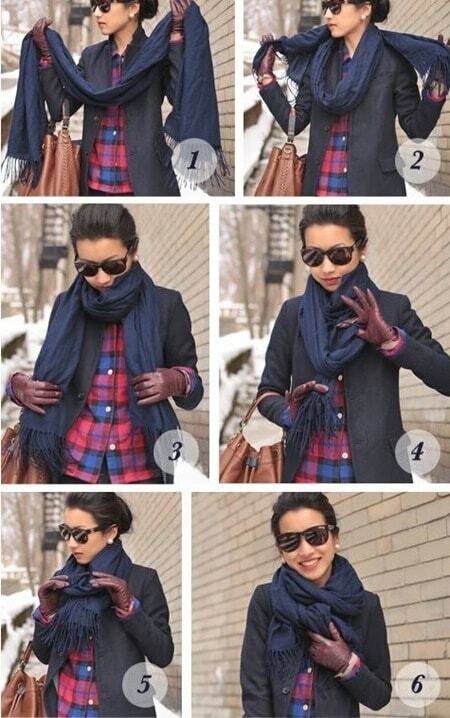 Pull both ends of the scarf down over your shoulders and let them hang. Grab the center of the scarf (loop resting over your chest) and make one twist so the loop now resembles a figure 8. Then, grab the right end of the scarf and pull it over the lower loop and through the loop. and Now, grab the left ed of the scarf and pull it from under the lower loop and through the loop. Tighten both ends and adjust as necessary to create a pretzel like formation. This unique way to wear a scarf looks so cute with a jacket or sweater! Start with a scarf centered around the neck back. Make a loose knot on one side of scarf near your collarbone. 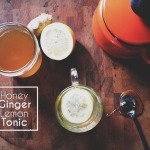 Grab the other side in the middle and slide the middle through keyhole, creating a loop. Tighten it according to your convenience. Tie each corner of the scarf to one another. There should be a total of two small knots. Put the scarf on, placing the tied ends at the back of your neck to hide the knots. The scarf should be one big loop. Loop the scarf over your head a second time. 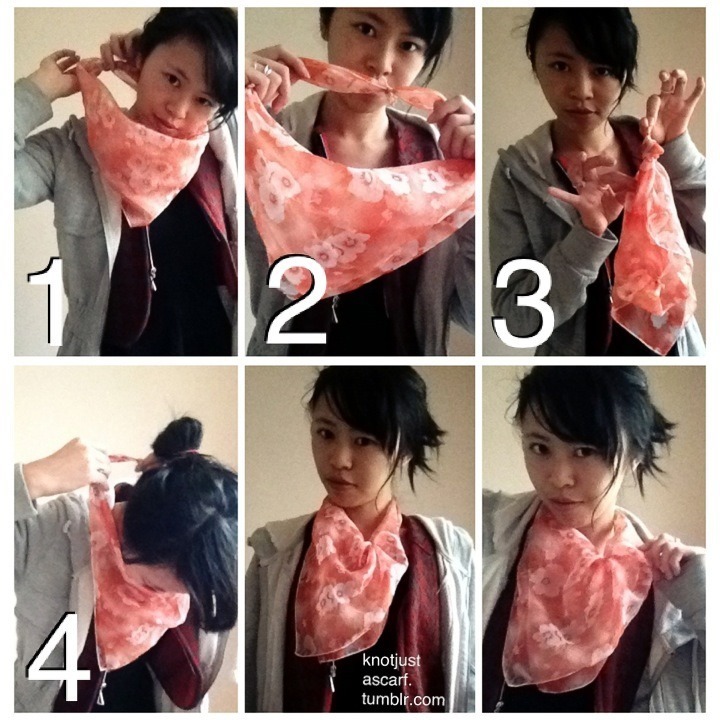 Fold a small square scarf in half along the diagonal and then tie the triangle around your neck. Next, slip it off your neck and you’re going to tie a knot in the middle of the inside of the triangle (unfold it to make it easier to tie a knot). This will create pleats on the outside of the scarf when you wear it. Put it back on over your head and you get a cool pleated look! 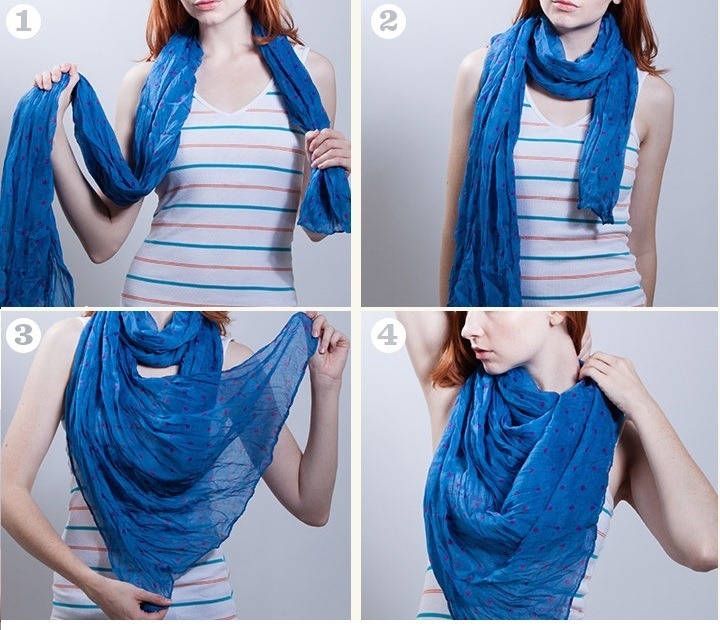 Perfect for showing off your favorite small square scarf’s pattern.